Welcome. I am so glad that you stopped by. My garden gate is always open for you to come in, relax and have a cup of tea. 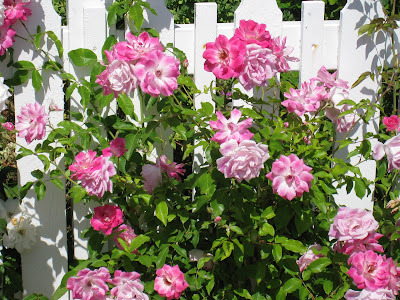 Today we are going to paint a little cottage with a picket fence and pink roses. First, let's leave my garden and take my studio assistant, Bentley, for a walk looking for inspiration. I loved the blue windows and door on this cottage and decided to paint the door and shutters on my cottage blue. This large cottage reminds me of a real English Cottage. Note the green bushes and hedges around the cottage. We will paint lots of green bushes around our cottage. I like the brick sidewalk and will paint one leading to our little cottage. Now that we have seen lots of cottages and climbing pink roses, let's go back to my studio and paint a cottage together. We will paint a small cottage to make it easy for beginners. I sketched out a little cottage with my paints (I use Liquitex acrylic) on a 9X12 canvas. You are welcome to copy my painted sketch. Note I put lots of green bushes around the cottage similar to the ones we saw in the above photographs. Sky is painted with Prussian blue mixed with lots of white. I base coated the door and shutters with darker Prussian blue and painted a brick sidewalk. I paint in the French Impressionist style and do not paint a lot of detail. I added lots of colors to the roof and painted a lighter color where the sun is hitting the roof. Next I painted a vine around the fence and base coated the roses with red. Always paint dark to light and put in your darks first. I also added roses around the door and on the roof. I started putting a lighter color over the dark red roses on the roof so you can see how to build up the color. Add some dark green under the roses on the fence and house - this will create the depth. Put different shades of green around the cottage for your bushes - then add touches of lighter green on top of the bushes where the sun light is hitting the bushes. Add darker blue to the top of the door and shutters - this will create the look of a shadow as the roof and roses will cast a shadow on the areas right underneath them. The completed painting - notice I went back and added some white highlights to some of the roses where the sunlight is hitting them. The painting is so small it does not have a lot of detail on the roses - the Impressionist style gives the impression of roses without the detail. You can paint with a small brush and add as much detail as you want to - it is just a matter of the style you like. For me, light, soft edges and loose edges are my style. Thank you for stopping by. I love hearing from you and sincerely appreciate your visits, comments and those who are following my blog. Please let me know if you have any questions or would like to see me paint something special. As soon as I find Lilacs at the flower market we will paint them. Next week we are going to Florida to visit "The Children's Garden" that my sister is bringing back to life after the big freeze in Florida this past winter. Welcome. I am so glad that you stopped by. We are still having cool weather in Southern California near the coast and I am still serving tea. My garden gate is always open to welcome you. Would you like to sit and relax while sipping a cup of mint tea? My garden is all decked out with flags to celebrate Memorial Day and to honor our Service Men and Women who have given up so much to secure our Freedoms both here and abroad. I have some fun "thrifty finds" to share with you. The red and white check chair cushions came from Wallmart - - Two for $10.00 or $5.00 each. They are made from a weather proof fabric and are perfect for my flea market garden table and chairs. The red and white check table cloth was $5.00 and it also comes in blue and white check. Bentley, my helpful Studio Assistant, is already in the garden looking for inspiration for a little flag painting to celebrate Memorial Day. My flea market Radio Flyer wagon is all decked out for the holiday. One of my favorite flea market finds is this window with a mirror and little window box. I love using mirrors in my small garden to create the illusion of a larger space. With so many flags around I could not resist painting a small pot of flowers all dressed up with flags. Flags flying on the bridge entrance to Balboa Island honoring our Service Men and Women. Bentley and I are off to Balboa Island to look for climbing pink roses and cottage inspirations for us to paint next week. 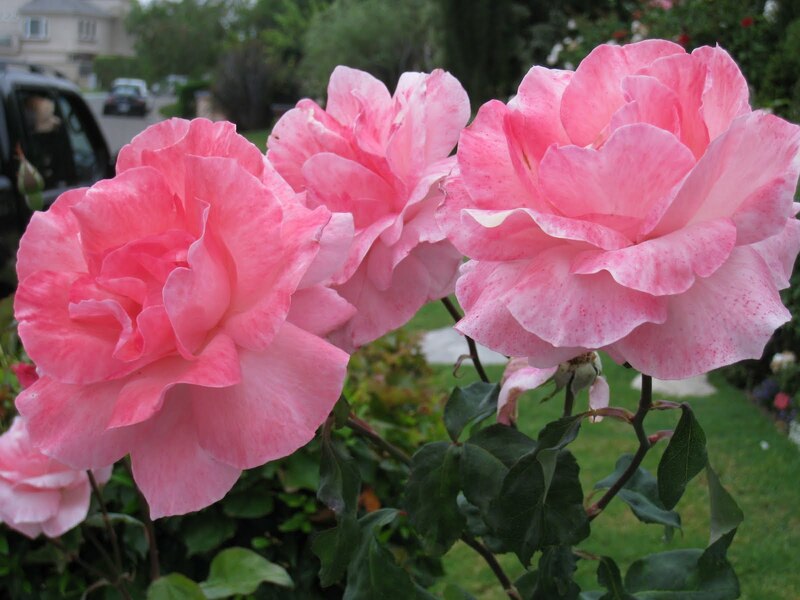 I received so many e-mails and comments on having a little art lesson on how to paint a cottage with climbing pink roses that we will paint a little cottage together next week. We will paint lilacs after we paint a cottage. Thank you for stopping by. I love hearing from you and sincerely appreciate your visits, comments and those who are following my blog. Welcome. I am so happy you stopped by - my garden gate is always open for you to come in and relax and have a cup of tea while I share with you the inspirations for my art. Bentley is already in the garden looking for inspiration. Finding Inspiration . . . . . . . The hydrangeas are starting to bloom and I am looking for inspiration for a new painting. This year I added touches of red to my garden to add a little brightness to my traditional English Cottage Garden colors. My garden is small and I am constantly rearranging it by moving the garden signs and plants in containers around for a different look. I received this beautiful lavender hydrangea when recovering from surgery and wanted to paint it before planting it. Here is a little painting of the lovely lavender hydrangea. Bentley seems to favor the blue hydrangeas. I love mixing colors together - seems like they are different every year depending on the type of fertilizer I use. My new garden look- mixing colors. I am constantly changing the colors in the basket of my vintage bicycle basket - what a great container for plants it makes. I decided to paint the blue hydrangeas and add a touch of pink with Iceberg roses along with the white Iceberg roses in a blue and white vase to tie the painting together. Thank you for stopping by. I love hearing from you and sincerely appreciate your visits, comments and those who follow my blog. Please let me know if you have any questions or would like to see me paint something special. I have requests to paint lilacs and an English cottage with pink roses spilling over a picket fence and will paint them soon. Lilacs are easy to paint and I thought it would be fun to have a simple lesson for you on painting lilacs. I do not have a Lilac bush and will paint them next time I find some at the Flower Market.